Little Lord Fauntleroy in a bottle. 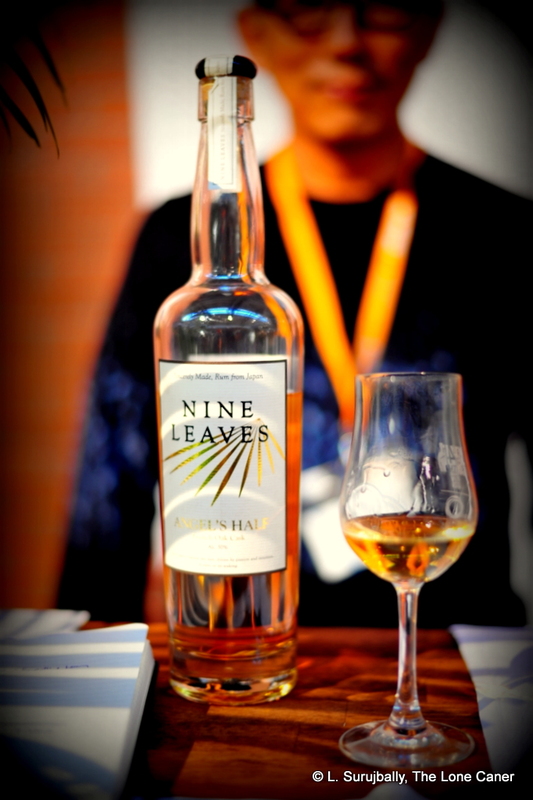 Back in 2014 I first encountered rums from the Japanese company Nine Leaves, and was impressed enough to not only write about the company in one of my Makers profiles, but resolved to not let Mr. Takeuchi’s work escape me a second year in a row. 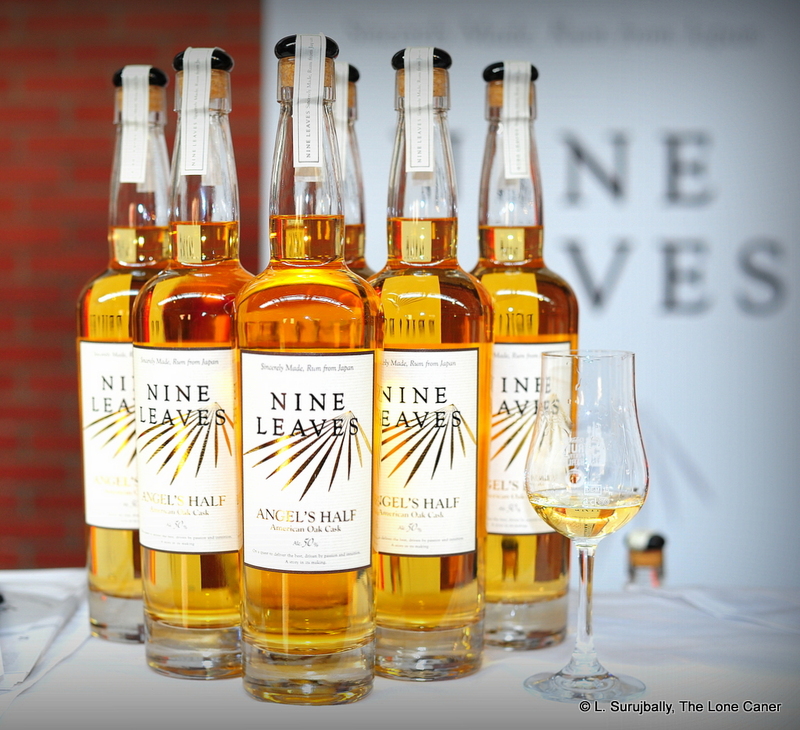 So said, so done…I’ve tried four more of the company’s rums, and begin working through the resultant reviews with the American Oak version, bottled in Spring 2015. As an aside, Mr. Takeuchi has certainly managed to elevate his company’s profile in 2014-2015. 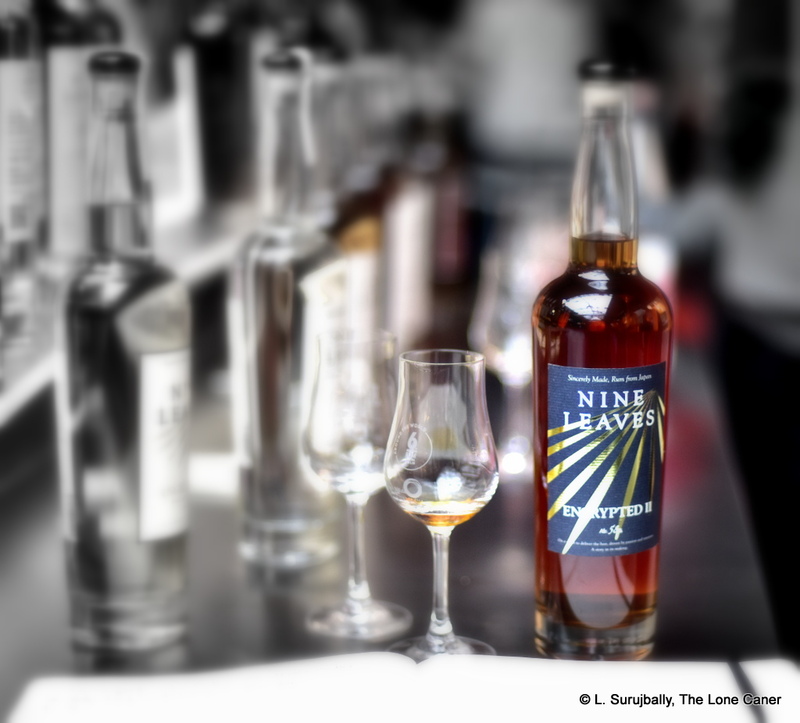 Presenting in Rome, Berlin, UK and Miami (and I’m sure there are others), his rums have won prizes at various festivals, Europe remains an expanding market, and one can only wonder at what this company will be like in ten years. 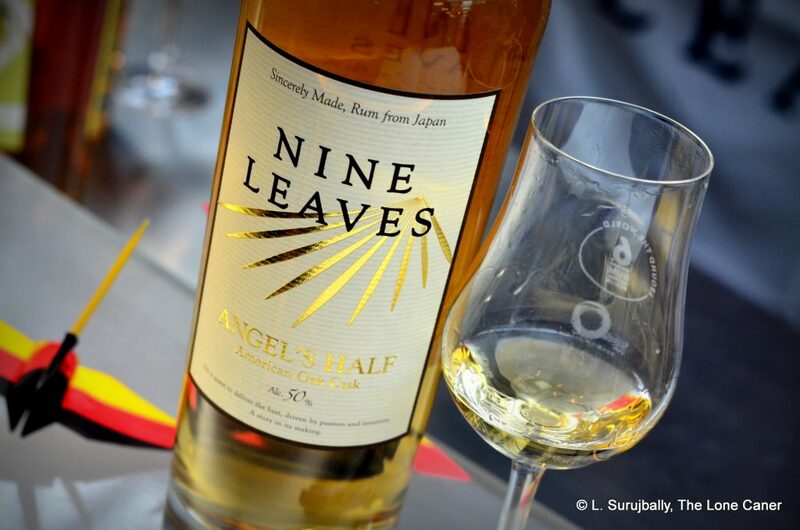 Production methods remain the same as before: Okinawan sugar cane, cane-juice basis, careful selection of cuts to bring out the best of the distillate, and six months ageing in either French oak or American oak. There are stocks now laid down to age for longer periods, but it will be some years before we see these. Let’s focus on what we have today. On the tongue, more spice could be noted. After trying it carefully for a few minutes, I was, to be honest, left scratching my head – there were salt, bitter, and sweet components in evidence, all at once; and that same light sweetness and almost-but-not-quite anorexia of the nose came through in the mouthfeel, somewhat to its detriment. Flowers, swank, vanilla, oak, cucumbers in a green salad (sans dressing), and then an amusing fanta and orange peel tango started going on at the back end. It was a young, light, frisky and well behaved rumlet, which faded gently into an easygoing, warm finish that was a little dry, but kept the party going with orange zest, delicate white flowers and a lack of aggro I found impressive for a rum this young, bottled at such a relatively high strength. Civilized is a word I suppose can be used to describe it. It lacks real deep solidity and maturity I prefer in my rums (y’know, like Jamaicans or Demeraras which land on your palate like an anvil dropped from ten feet up), but its construction is almost playfully elegant. 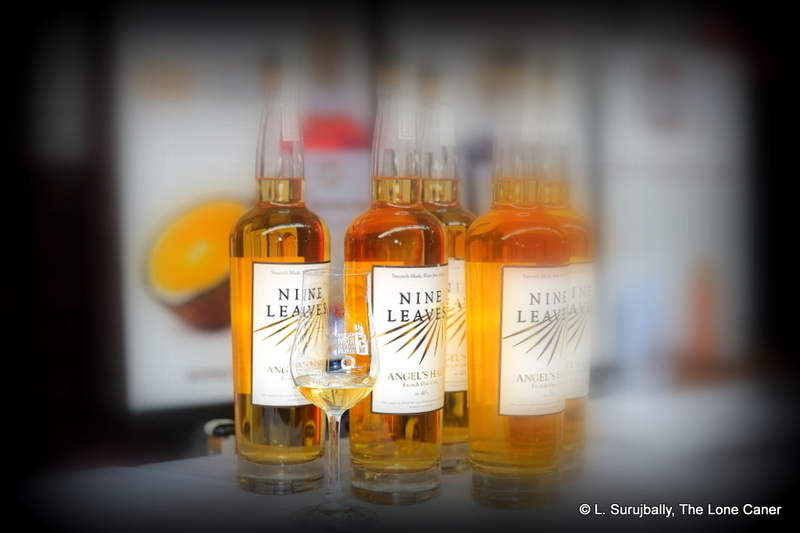 Yes, there was a shade too little ageing, yes the French oak version is even lighter in texture, yes, perhaps it was too dialled down…but you know, I really don’t know that many producers who can take a rum this young and maintain a balance between the intensity of a full-out, pot-still, zero-year-old white, and something a little older…who can make something so interesting out of it. Maybe it’s the double distillation, maybe it’s the pot still, the light ageing regime, the cuts, the casks or something, but I’m not complaining too loudly. This is a pretty damned good young rum, and I’m sure glad I tried it. 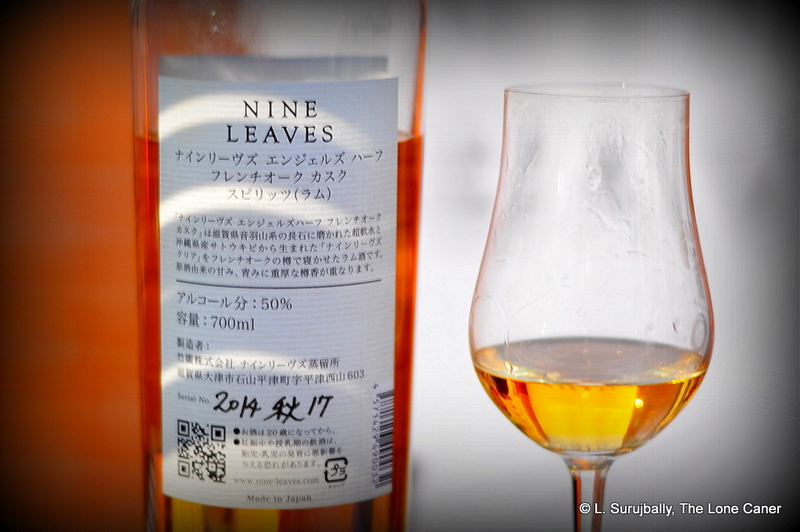 A Japanese pot still rum of clout and flavour, perhaps needing some more ageing to score better and reach a wider audience. 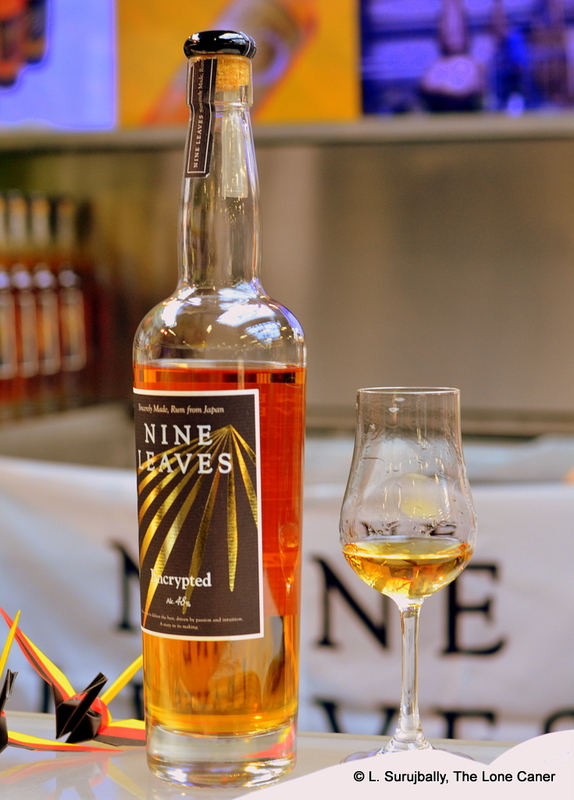 In five years of writing about rum, I’ve seen quite a few new rum-making enterprises come across my radar: Elements, Koloa, Downslope, Ocean’s readily spring to mind. 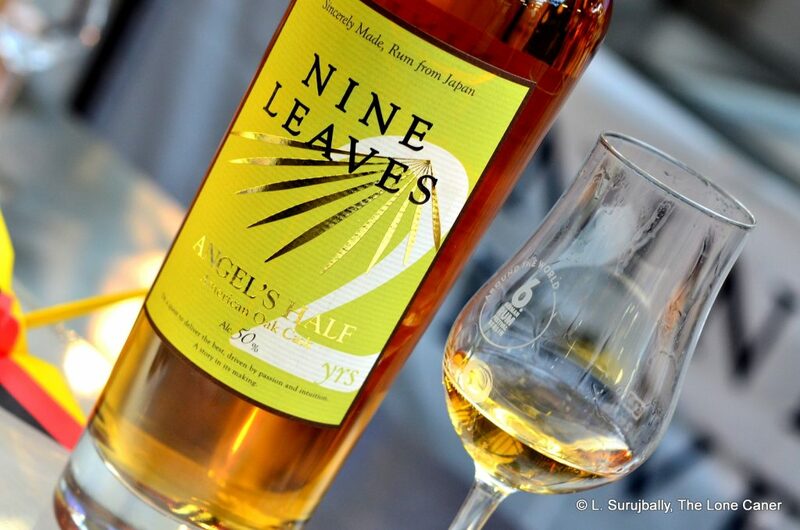 Now they are joined by a new outfit called Nine Leaves, which may be unique in that it’s a distillery, a bottler, and a distributor, all run by one person: Mr. Yoshiharu Takeuchi, who operates in the Shiga Prefecture of Japan (the company was formed in 2013). 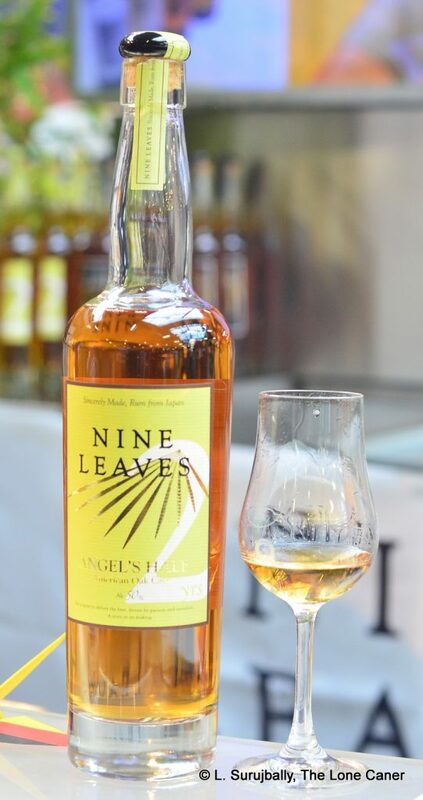 At this point in time in their existence, Nine Leaves makes three rums: a white (called “Clear”), and two “Angel’s Half” rums – perhaps so named because Mr. Takeuchi takes half of his distillate and ages it for six months in fresh American oak barrels, and the other half for the same period in French oak. 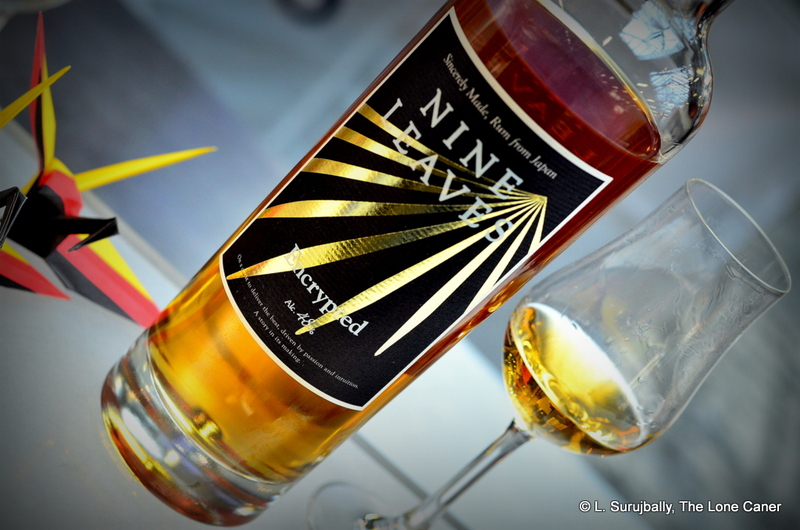 It was the latter which I tried, largely because I was quite enamoured of the golden colour and its viscosity as it rolled down the tasting glass (not the best reason for trying a new rum, but I’ve done worse for really stupid reasons, so this almost classes as sober judgement on my part). Speaking to Mr. Takeuchi revealed the following facts about him and his rum, which, much like the Ocean’s Atlantic edition 1997 I looked at not too long ago, is something of a labour of individual love: he’s a one man operation, who brought the distillery to life when nothing in his past (or that of his family) would suggest such a thing. The sugar originated from Okinawa, the water used came from an underground spring in Shiga. The barrels came from the US and France, and a Forsythe copper pot still was bought in Scotland. So once again I was sampling a pot still product, bottled at a full proof 50%, and the theory of terroire having a detectable impact on the final product was put through its paces. Now pot stills preserve a large part of the flavour of the distillate and this bleeds over even after substantial ageing which itself adds extra layers of complexity – but with only a six month period, was it all enough? I thought so…to a point. Consider the aromas hailing from the golden-hued rum: sharp and estery, light raisins and figs, salt biscuits, butter…and all those attendant scents of rubber and wax polish, even some fresh sawn woodchips, like one was entering a brand new house fresh from the builders and still in the plastic wrapper. There were some faint background notes of caramel and vanilla, but these were waiting for a turn on the stage that didn’t materialize until the actual tasting. Which was pleasantly intense, as befitted a 50% rum, and this is where I think some more time in the barrels might have improved the product. It was a firm, medium-bodied-verging-on-light rum, which retained some of that sharp peppery consistency of the nose; the caramel notes now came forward, incense sticks, biscuits, vanilla, coffee; and yes, the waxy, rubber tastes were there, as well as green herbs – dill, maybe (no, really). 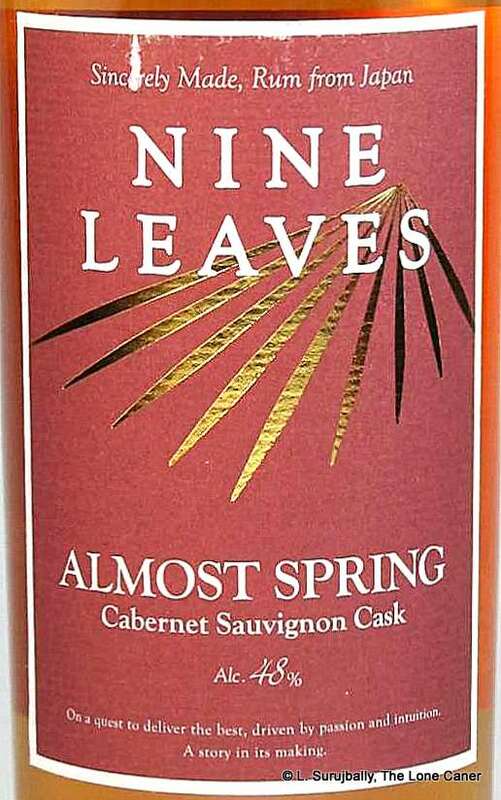 A very very original palate, fading well into a clean exit of some length, redolent of cane juice, a touch of vanilla, and a last mischievous wink of coffee grounds. Still, unlike the Rum Nation Jamaican White Pot Still 57%, the Angel’s Half French Oak Cask somehow missed the mark of having all these flavours blend together seamlessly (and that other one, you will recall, was utterly unaged); plus, it still feels a little too raw, which I imagine further ageing would iron out. Yet I must concede the overall experience was pretty good, which speaks well for Nine Leaves’s expertise here. The question that occurred to me was, for whom and for what is this rum made? I’d suggest it’s not for freshly press-ganged sailors in the Navy of Rum Appreciation, who are only now beginning their journey, or those who prefer more standard profiles – it really is too different for that. I think it’ll make a cocktail that’ll blow your socks off, and taken neat, with its heft and remarkably different, fresh profile, aficionados who drink a lot of rum would really enjoy it (as might maltsters). 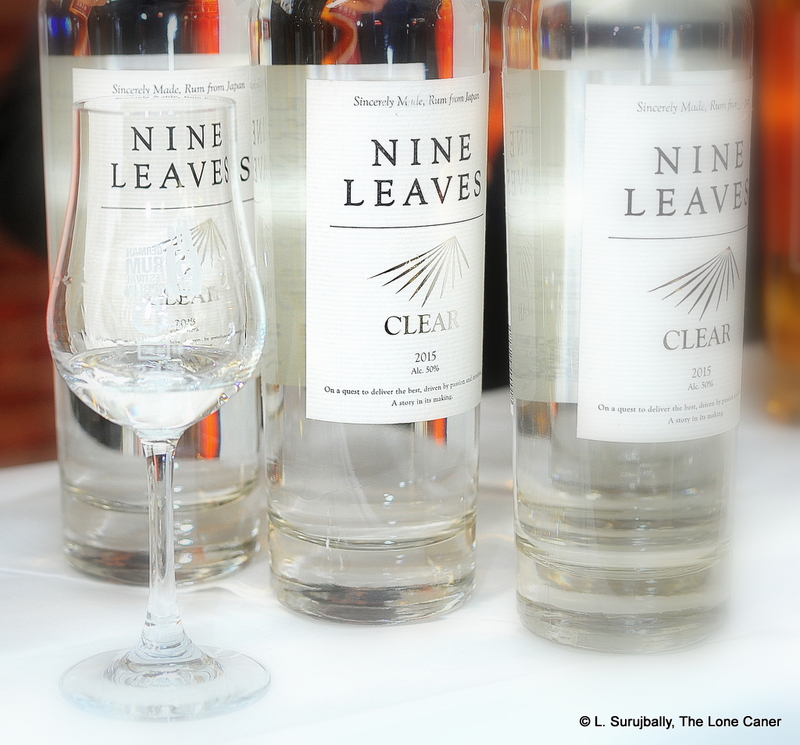 Nine Leaves is worth keeping an eye on. Mr. Takeuchi is clear about his intention of keeping his distillery going for the long term, ageing the rums for longer periods, and developing his blending skills, his market, and his entire product range. He sees his enterprise as something of a constantly tweaked, incrementally refined project. That’ll surely be something to watch, in the years to come, for a rum maker who seems to enjoy running apart from the mainstream. Because already he has a made a good rum right out of the gate — one you will assuredly not mistake for any other. Forsythe copper pot stills are made in Scotland by the eponymous company, and while it’s now a smaller part of their overall business, they still handcraft them (as they have since 1890). 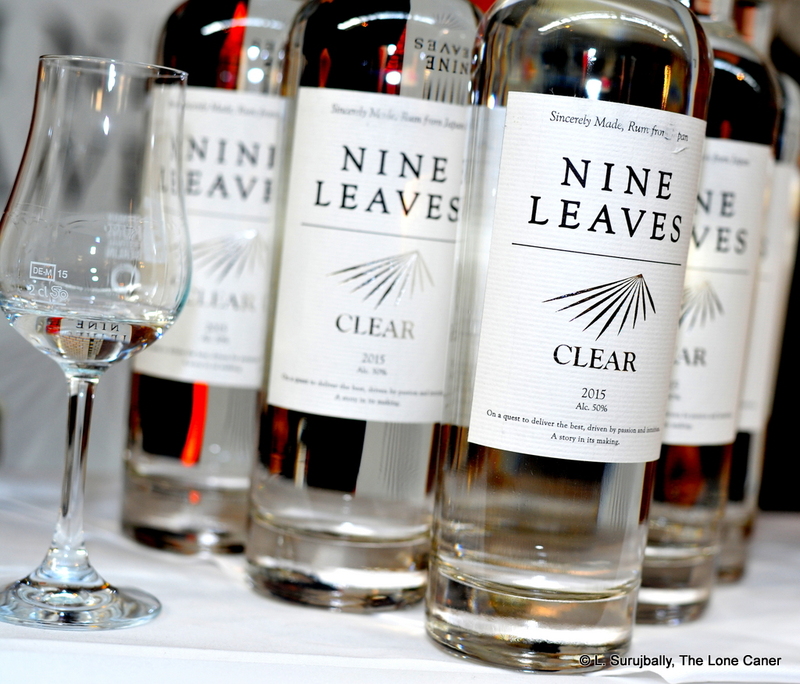 Nine Leaves’s model is supposedly similar to the one in business at Glenmorangie.